Preparations for the 3rd annual Mernda Community Fair to be held on Sunday 29th March 2015 are well underway! The previous two events attracted thousands to the center of Mernda Villages to find out about what’s happening in their local community, and to take part in the great free and cheap activities on the day! There will be something for everyone, with fun and entertainment for all ages. Local community, sports and dance groups will be in attendance, and we will have a market area with a wide variety of goods for sale. Music and performances will be running throughout the day, as well as free balloon art, and super cheap pony rides and face painting. This year the YMCA will be bringing their mobile skate ramp and providing free clinics, right in the middle of Mernda Villages! Skateboards will be provided. We also have extreme mountain bike demonstrations from an Australian Mountain Bike Trials champion, petting zoo, reptile display, fire engine rides, classic cars display, and more! If you are interested in having a stall please complete the online Stallholder application form. We encourage all local community organizations and businesses to get involved, including sports, dance, self defence, schools, and local businesses. If you are interested in being one of our sponsors, please contact us at communitylife@madra.org.au. MADRA would like to thank our Gold sponsors Stockland and Costa Group, and our Silver sponsors Trafman, Bendigo Bank and the City of Whittlesea! For all the latest updates on the Fair, please visit (and like) our Mernda Community Fair Facebook page! 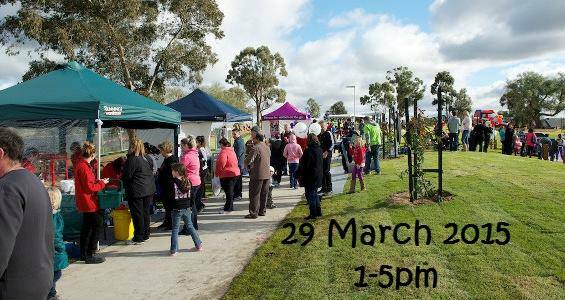 MADRA is pleased to announce that the 3rd Mernda Community Fair will be taking place on March 29th, 2015 from 1pm to 5pm! 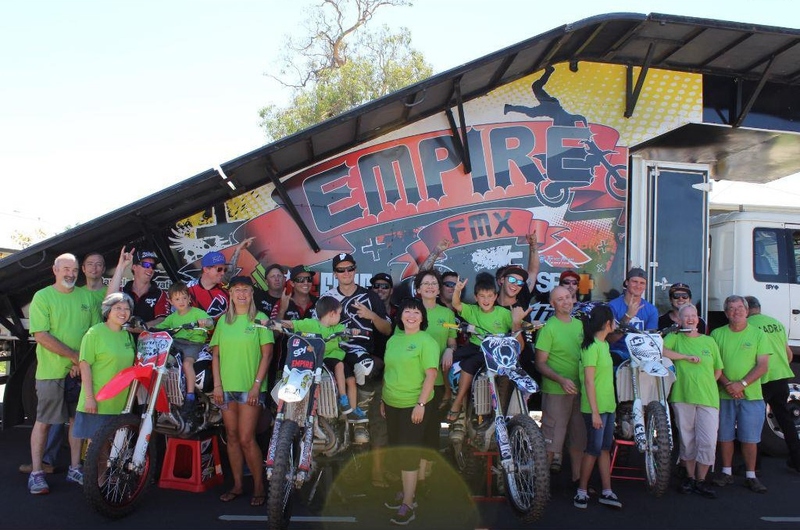 The first two Town Fairs in 2012 and 2013 provided a great family event for Mernda and the surrounding suburbs, with plenty of free entertainment, including the very popular Empire FMX bikes doing stunts in the middle of Mernda Villages Drive, and performances and demonstrations from local groups on the main stage. The last Town Fair attracted 5,000 people, and this year we hope to make it even bigger! If you are interested in having a stall please complete the online Stallholder application form. Stalls will include community groups, food vendors, sports, dance, schools, as well as a market area. On Wednesday 21st May there will be an opportunity to ask questions of a panel of senior police from the local area, and to learn about policing for this area. There will be representatives from Epping, Mill Park and Whittlesea police stations, the Whittlesea Criminal Investigations Unit and Highway Patrol. It would be great to see people from Mernda and Doreen attending to show the importance of police presence for our community! 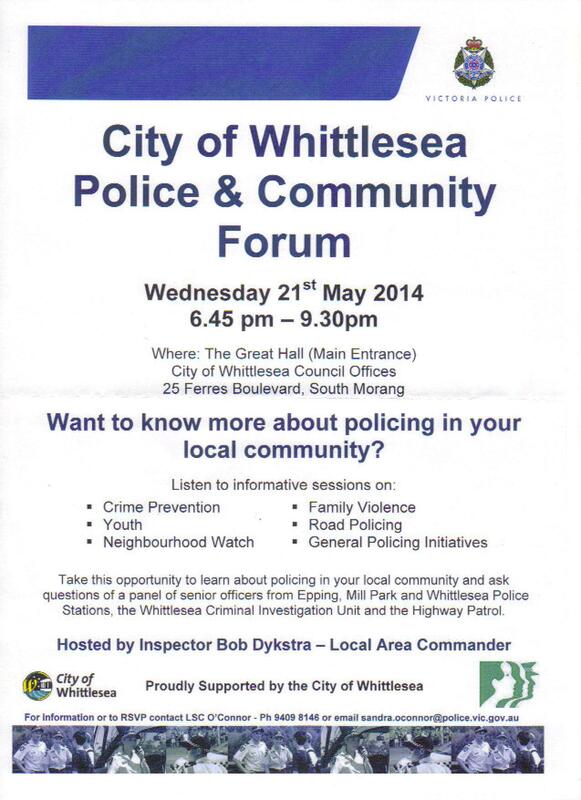 The City of Whittlesea Police and Community Forum is from 6:45 pm to 9:30 pm on Wednesday 21st May, at the Great Hall, Whittlesea Council Offices, 25 Ferres Blvd South Morang. Please note that there will be no MADRA meeting in May, and members are encouraged to attend this forum. The next MADRA meeting will be on Wednesday 18th June. 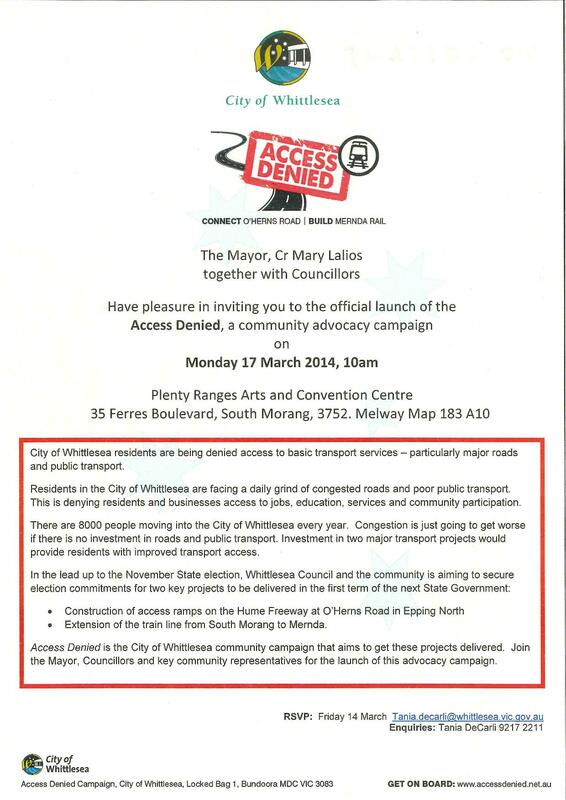 The official launch of the Access Denied community advocacy campaign will be on Monday 17th March, 10 am at the Plenty Ranges Arts and Convention Centre, 35 Ferres Boulevard South Morang. Whittlesea Council and the community are aiming to secure two election commitments – construction of access ramps on the Hume Freeway at O’Herns Road in Epping North, and extension of the train line from South Morang to Mernda. All are welcome to attend! Mernda Blue Light Disco will be held on Friday 31st at 7pm.